Bones, brains, and blood galore-a feast fit for a zombie! Wear your love of the undead in your wardrobe with the Zombie Feast T-Shirt. With such vivid and lifelike details, onlookers will definitely be feasting their eyes on you! This t-shirt is made from heavy duty cotton, and it has a relaxed fit so it is comfortable to wear. 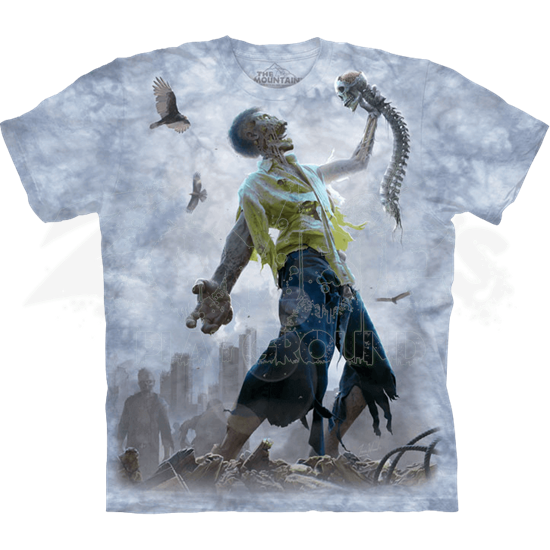 Depicted on the front of the shirt is an undead beast, his mouth open in a scream as he laments that he has already eaten all of the remaining living humans! He stands in a pile of bones as scavenging birds circle above him. In the background, you can see a horde of brain-eating ghouls making their way toward the scene. Little do they know, there will be nothing left for them when they get there! Tell a story while you show your love of zombies in your wardrobe with the Zombie Feast T-Shirt!